St. John Vianney Parish assisted Our Mother of Mercy Parish in Pass Christian, Mississippi rebuild their parish buildings after Hurricane Katrina. Their rectory and a former convent were destroyed by the hurricane. The church and parish center suffered extensive damage, but could be rebuilt. A group of parishioners went to Pass Christian in January 2006 to install a new roof and repair the exterior brickwork on the Parish Center. 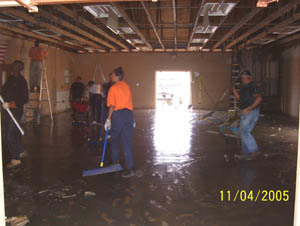 In March 2006, a contingent worked on the interior of the Parish Center installing a new electrical system, insulation and wallboard. In June 2006, we returned to install new windows and complete the electrical wiring for the Parish Center. In September 2007 we worked on the new rectory installing the roof shingles, electrical wiring and windows.